The rotator cuff is compromised of 4 major muscles and tendons that act collectively to stabilize the shoulder joint. The four muscles include the supraspinatus, infraspinatus, subscapularis and teres minor. Tendons are the fibrous portion of the muscle that anchors the muscle to bone. This fibrous anchor can be inflamed resulting in a tendinitis or can be chronically degenerative resulting in tendinosis. The one of 4 muscles can have a partial or full thickness tear. At the Centeno-Schultz Clinic ultrasound is utilized to determine the source of pain. The pain may arise from a tear in one or more of the four rotator cuff muscles or inflammation or degenerative changes in the fibrous tendon anchor. Other explanations exist which will be discussed in another blog. Rotator cuff tears can be treated with Regenexx SD whereby a patient uses their own mesencymal stem cells. Tendinosis can be treated with Regenexx SCP. The Regenexx family of procedures represent the highest quality stem cell therapy with the largest number of stem cell treatment options in one clinic and which are ICMS certified. Patients with shoulder pain unresponsive to conservative therapy often are prescribed radiographic studies for further evaluation. X-rays can not reveal rotator cuff tears , since tendons are compromised of soft tissue and not bone. X-rays evaluate bone. Another diagnostic modality is ultrasonography, which does not expose the patient to radiation and is less costly than MRI studies. Teefey demonstrated that when ultrasonography and magnetic resonance imaging studies are read by radiologists with comparable experience, they have comparable accuracy for identifying rotator cuff tears. What if the study is abnormal? Tempelhof examined the prevalence of rotator cuff tears in patients WITHOUT shoulder pain. He evaluated 411 volunteers and divided them into four age groups. 51% of the volunteers who were older than 80 years of age had a tear in the rotator cuff, yet no pain. The authors concluded that rotator cuff tears are present in patients without shoulder pain and increase in prevalence with age. The key is to have a thorough history and physical examination. Radiographic studies should be used in conjunction with the examination to accurately determine the source of pain. At the Centeno-Schultz Clinic we are committed to this standard. There are many therapies for rotator cuff tears which include prolotherapy and stem cell therapy. Utilizing a novel technique, patients are able to use their own stem cells to regenerate torn or damaged ligaments, tendons and cartilage. rototercufftear.rotatercufftear.MRI imagesrotatorcuff tear.stemm celltherapy.steme celltherapy. Rotator cuff tears often result in pain over the front and outer aspect of the shoulder. The pain maybe increased when pushing upwards on the shoulder or reaching forward. Weakness may also be reported. 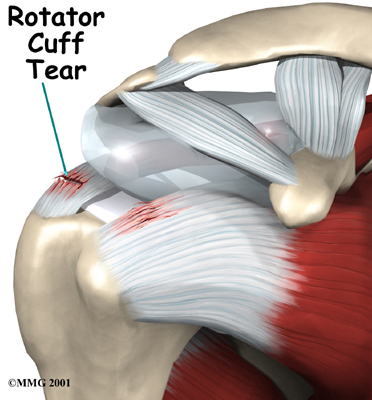 Unfortunately pain and weakness do not make the diagnosis of a tear in the rotator cuff. Park et. al., demonstrated that to best way to diagnose full-thickness rotator cuff tears on physical examination is when the painful arc test, the drop-arm sign, and weakness in external rotation were all positive. These are known as the rotator cuff signs. The painful arc test is positive if the patient has pain when raising their arm from their side upward beyond the level of their shoulder. The drop-arm sign is the inability of a patient to hold the arm up at or above the shoulder against gravity. Please click video for a demonstration of this test. Surgery is a common treatment of tears in the rotator cuff. An alternative is the use of stem cells to regenerate damaged tendons, ligaments and degenerative cartilage. Regenexx enables a patient to use their own stem cells to regenerate tears in the rotator cuff without surgery, anesthesia or extensive rehabilitation. Rotator cuff surgery involves repairing one of the four principal muscles of the rotator cuff. Typically this is accomplished through arthroscopy in which the surgeon visualizes and repairs the defect through a small camera. Sometimes the damaged muscles and ligaments are too extensive and the shoulder has to be cut open. Rehabiliation post rotater cuff surgery is extensive. The intital phase is one of immobilization during this time muscles begin to loose their tone and strength (atrophy). The joint can also stiffen due to lack of use. One week post rotator cuff surgery, physical therapy begins with the goal to regain flexibility and strength . For the first twelve weeks emphasis is placed on optimizing the flexibility and range of motion of the shoulder through gentle stretching exercises. Driving is not recommended for the first month after rotator cuff surgery. After three months strengthening exercises are added. Repairing partially torn tendons or ligaments in the shoulder is now an option using stem cell therapy. Regeneration of worn or damaged cartilage in the shoulder joint is also an option using stem cell therapy. Regenexx enables patients to use their own stem cells to repair damaged tendons, ligaments and cartilage in the shoulder thereby avoiding surgery, anesthesia and the extensive time, energy and expensive of physical therapy. Please review the testimonial of a patient who had tears in both rotator cuffs who underwent surgery and extensive rehabilitation for the first shoulder but elected stem cell therapy for the other side. Recovery time from shoulder surgery varies on the type of surgery performed. The shoulder is a complex joint made up of ligaments, muscles and cartilage. The major muscles are the supraspinatous, infraspinatus, teres minor and the subscapularis, which together comprise the rotator cuff. Ligaments are the fibrous tissue that connects bone to other bone. Recovery time from shoulder surgeryis dependent upon the type of surgery. Rotator cuff surgery involves cutting one or more of the references muslces and reattaching them. In patients with loss of shoulder cartilage the surgical options include humeral hemiarthroplasty and total joint replacement. In all cases there is a significant amount of immobilization which can result in muscle weakness and atrophy. Rehabilitation is aimed at re-strengthening the weakened muscles and restoring function. Unfortunately this can be a long and painful process. Patients that have a rotator cuff tear or ligament tear now have an alternative to shoulder surgery and the extensive recovery time. At Regenexx, a patient’s own stem cells are utilized to repair the damaged muscle or ligament. It is a simple needle in, needle out procedure that does not expose the patient to the inherent risks of surgery or anesthesia. The stem cells are placed under x-ray guidance into the area of damage. This simple needle procedure can replace the scalpel and avoid theextensive recovery time from shoulder surgery. Please click testimonal of a patient what underwent successfull repair of torn rotator cuff following a failed surgery. reovery time shoulder surgery.Regenexx. alternatives to shoulder surgery.